This card typically depicts a hand coming out of the clouds holding a single pentacle. Below is the lush landscape of all things positive, abundance and growth. 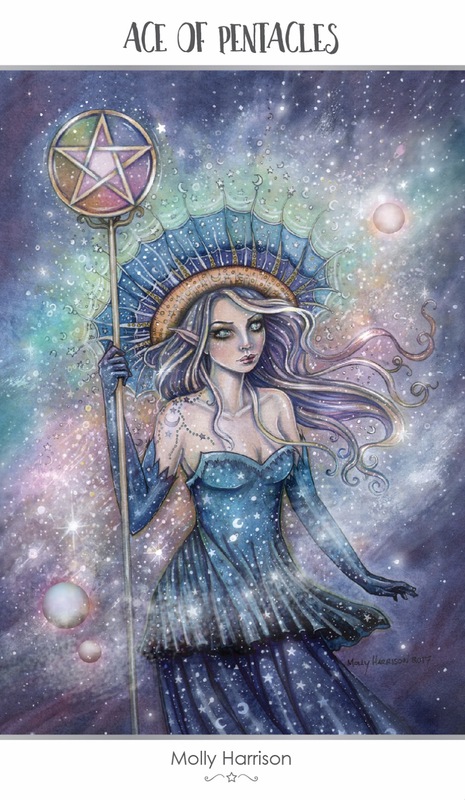 While my card is a bit different from the common depiction, I have decided to incorporate a beautiful astral being wearing a crown to symbolize “wealth” and she is emerging out of a cloud of galactic sparkles, planets, stars and moons rather than a typical earthly cloud. Her hand is holding a staff which supports the pentacle. To depict abundance and positivity I added hundreds of stars and sparkly elements (typically illustrated by flowers and greenery below the cloud). To emphasize an optimistic feel, I decided to use a dynamic color palette – not just dark blue/black space, but subtle pinks, greens, and yellows that emit a more upbeat and uplifting feel. A beautiful, celestial queen stands, surveying her domain. She is bathed in mist, her attire full of stars and moons, as though she is made of these – formed by the universe itself, as though she has materialized only to offer you an invitation. She is opening up the galaxy before you, giving you new opportunities to create and grow anything you want. But she is not handing you piles of gold…that you have to make for yourself. When this card appears in a reading, it’s prompting you to keep your eyes open for new opportunities. Not for any get-rich-quick schemes, risky ventures, or easy money, they won’t work in the long term. Instead, look out for chances for steady growth. This is a time for measured, grounded behavior that helps existing seeds to grow to fruition. For chasing your dreams, and finding practical ways to achieve them. This entry was posted in Artist, Deck Review, Featured Card of the Day, General Tarot, Readings and tagged 78 Tarot, Ace of Pentacles, Astral, Tarot.